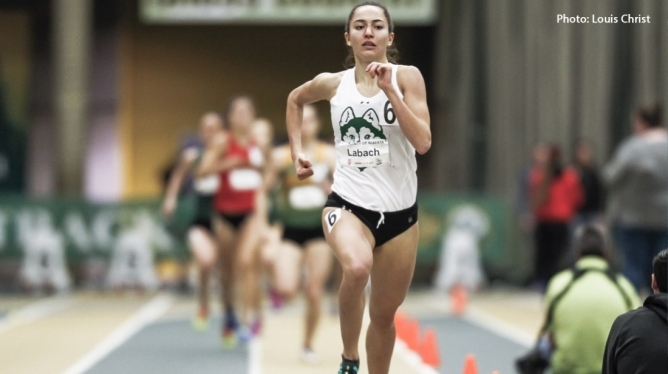 Since winning her first national medal in the 800m at the 2017 Canada Games, Julie Labach has made a name for herself as one of the top middle-distance runners in Canada. Her personal best of 2:02.07 in the 800m that she ran at the 2018 Canadian Championships puts her in contention for several national teams this summer including FISU World University Games, Pan American Games, and World Championships. Julie is recently coming off an indoor season where she won the USports Female Track Athlete of the Year award and picked up three medals at the USports Championships for the University of Saskatchewan Huskies. Last week, I sat down with Julie to talk about her past season and her future plans in the sport of track and field. Daniel: When did you get started with track and field? Julie: Soccer was always the sport I played competitively growing up. I ran for my elementary school track team. I did the elementary relays in the summertime [in Saskatoon], and I ran for my high-school. Before the first meet in elementary school, I had never run on a rubber track before, and I was nervous. My dad told me we could go to [the track] since we lived pretty close. We walked over to see if it was open so I could do a practice lap. STFC [Saskatoon Track and Field Club] and the university team were training, and Murray [Julie's current coach] was there. My dad talked to Murray and asked him if his ten-year-old kid could run on the track. Murray said, "Go ahead. We're done." That's when I met Murray, and after that, he would always tell me "You should join track." And I would say "No, I'm playing soccer all year round. When I committed to the UofS soccer team six or seven years later, he told me "You know, you can be on the track team, too. We'd love to have you." And I thought that could be kind of a cool thing to do. Daniel: Are you still Playing Soccer? Julie: No, this is my first year not on the soccer team. I played both sports in my first four years, and this year I just did track. Daniel: Is that because you wanted to focus on your track career? Julie: Yes, for the most part. I started law school this year, and I felt it would be difficult to do law with the two sports. When I decided to stay [in Saskatoon] for law, a very large reason was because I felt it was the best decision for me track-wise. Like, if I'm saying I'm committed to track then I really should be. I felt like I should be all in. So this is me trying to be all in. Daniel: Did you have any set goals for yourself coming into this USports season? Julie: I did. It was hard because last year was what I call ?the dream year.' My third year wasn't great, so I had no expectations coming into fourth year. And then everything went well. I wanted to do as good or better this year. I didn't want last year to have been a fluke. In my head, coming into the season, my dream goal was to win a gold medal in the 600m, 1000m, and 1500m. Doing the triple and winning a national team title. Unfortunately, I caught quite a bad bug at the end of December/early January so that set my training back, and we had to re-evaluate a little bit. Daniel: How long did that affect you? Julie: I was quite ill for about a week. It was terrible. For the next month to month and a half I was sort of sick, so it affected training and the first few races. Daniel: Do you think your standards are high for yourself? Julie: I think so, but the same could probably be said for most athletes at this level. I'm pretty competitive, and I'm always looking to improve. I feel like, with track, as soon as I accomplish one thing there's always something else to aim for. There's always another time to hit, another race to win, or another team to make. That's part of what makes this sport so fun. But this year I made a conscious effort to appreciate and celebrate each race before immediately gearing up for the next. I really wanted to take things in because it's my fifth year as a Huskie and that's pretty special to me. Daniel: Are you planning on doing an outdoor season this year? Julie: Yes, I am. This year is a really big year for national team opportunities. There's FISU [World University Games], Pan-American Games, and World Championships. I've never made a national team before, and I would really like to. So that's a big goal for this summer. Daniel: I imagine you're already pretty close to FISU standard? Or you have it already? Julie: I'm under the standard. The standard is 2:05 so my [2:02.07] from last summer will count. It will be a matter of being in the top two. May 12this the deadline. There are a lot of girls under the standard so it's pretty competitive. Daniel: How do you rank right now? Julie: I'm not sure right now because I'm not sure who else has declared. I think I'm either second or third. So [making the team] is definitely a realistic possibility. Daniel: What are your long-term goals? Julie: Obviously, the Olympics is a big one. I'd love to get a national record. I was in the race when Jenna Westaway set the indoor 1000m record in Boston. I didn't know it was a record attempt. I wasn't even sure what the record was. The 600m record has been on my radar because I'm about a second off. To someday have the 600m, 800m, and 1000m record would be incredible. There are a lot of girls running fast so it won't be easy. Daniel: What's your relationship with your coach Murray McCormick like? Julie: It's really good. Murray is my primary coach. Jamie Epp and Jason Reindl also help out. Everybody plays a different role. I call them ?my team.' Generally, when I have a question, they all agree about 90% of the time. I find it reassuring because they all bring different perspectives. At nationals, Murray came to me with the plan for the 600m. He said "This is what we're going to do." And I told him "I feel a bit nervous about this." But then I talked to Jamie, and he said "Nope, that's what you need to do." And I talked to Jason, and he was like "We all agree, this is what you need to do." I followed the plan and ended up winning the gold medal. I'm really lucky to have all three of them. Daniel: So does Murray make all your workouts? Julie: Yes, he handles all of that. Daniel: What's Jamie's role? Is he more of a mentor? Julie: Jamie is one of the most decorated Huskie athletes of all time. He had an incredible distance running career so he brings the [athlete's perspective] because he's been through a lot of this. [TheHuskies] are really lucky to have Jamie for everything. He's able to travel with us often. Daniel: And what's Jason's role? Julie: Jason is the head coach of the Huskies and has been involved with Athletics Canada in a coaching role. He's been helpful navigating national teams and potential carding. And he's good at making the full-year plan, like thinking about what meets we want to go to. He keeps us all organized and on track. He's the one who's like "Did you fill out that form?" Daniel: Are there any meets on your radar that you're thinking about for this summer? Julie: [My coaches and I] are sitting down this week to make a plan. We're putting a lot of emphasis on making a national team. Probably as soon as finals are done [in mid-April], we'll go down to the United States to get some fast races in before the World University Games deadline. There's a couple meets in California. Daniel: Are there any of your accomplishments that you're particularly proud of? Julie: I don't know if you count Canada Games as a national title, but if you do, my three national titles are all very special to me. The Canada Games 800m was my first win on a national stage. And that felt huge. I passed the leader on the home stretch, and I still remember the feeling when I crossed the finish line. I was ecstatic. I get pumped just thinking about that race. Daniel: How do you think soccer has helped your soccer career? Julie: I think soccer gave me a lot of non-tangible strengths. Mentally, for sure. Daniel: Do you ever miss the team aspect of soccer or do you feel like you get that in a different way in track? Julie: I definitely do miss the team aspect of soccer. In my first three years of track, I didn't really hear much about winning a team title. Maybe we just weren't that competitive in my first few years. But winning both the men's and women's team titles this year was incredible. I really felt the team atmosphere and positive energy. This is kind of a funny story, but at CanWest, somebody stepped on the heel of my shoe during the 1500m, and my heel popped out. I didn't know if I should kick it off, so I kept trying to jam my foot back into the shoe, but it didn't work. It was a gong show. I wouldn't be able to kick at the end of the race, so I thought maybe I'd try to kick the shoe off and sprint for the last 100m. For one second, I thought maybe I should stop running. I had already qualified for USports. But then I was like "No, you have to finish. Our team needs the points." Daniel: If you were going to give advice to a young runner, like high-school age, what would you tell them? Julie: It might sound cheesy, but I think I would tell them to make sure they're having fun with it. That was hard for me when I first started training. I was like "We just run laps? That's all we do? This is hard. What about this is enjoyable?" I think it makes it easier when you have a really great training group. I like running with the boys. It makes it fun. You can't be racing in every rep, but it makes it so every practice isn't just mindless running. Daniel: If you were going to start your track career again, based on your interest not abilities, what event would you choose? Julie: I think multi-events, or pole vault, or high jump. I love the idea of doing multiple events. Any multi-eventers reading this are probably cringing, but to me, it seems like you have multiple tries and it's an ongoing event, which is different from track. It reminds me more of soccer. I think pole vault speaks for itself. It's the coolest. And high-jump. I was good at high-jump in elementary school, and I really liked it. So one little part of me is always like maybe I could have been a high-jumper. I convinced Murray to let me do one jump in practice last year. I didn't warm-up or anything, and I absolutely smoked the bar with my back. He was like "You're never going to do that again." Daniel Yetman is a content writer and triple jumper from Halifax currently living in Saskatoon. After completing his BSc (Hons) in Kinesiology at Dalhousie University, he moved to South Korea for two years. In 2019, he graduated with an MFA in Writing from the University of Saskatchewan. Professionally, he focuses on topics including sports, health, nutrition, and fiction.